Happy One-Year Anniversary to ThrewRedButter!!!!! Thank you to those who have been since Dale's Pale Ale! Plus, I needed a reason to open something awesome, so here we go. 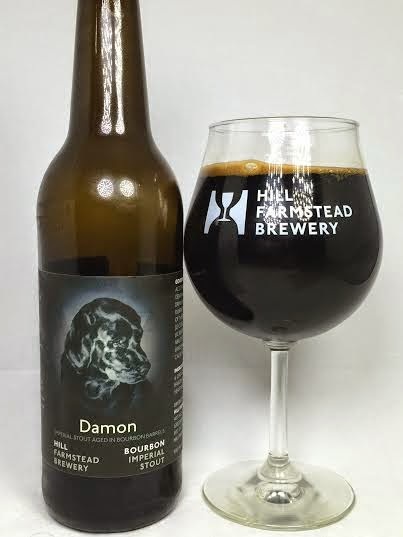 Damon is a Russian Imperial Stout with many variations. There is a Bourbon, Port, and Double Barrel version of this beer. I got this one in 2013 at the release (which was f***ing madness) and have just been sitting on it for no good reason. The time for waiting has officially come to an end. As expected, it pours pitch black, no light getting through this, no ruby red or brown on the edges. Even pouring aggressively produced less than a finger of dark brown head. Bourbon is still pretty damn big on this one after two years. It has some booziness on the aroma, but not hot. Nice oak/wood from the barrel and some subtle coffee. The taste yields a lot more chocolate than the aroma would lead you to believe. It's similar to fudge or brownie batter, which yes, is delicious. The bourbon is front and center and at times it's overpowering. I can definitely pick out other flavors such as charred oak and some dark roast coffee, but the bourbon is finding a way of cutting to the front of the line each time I find something new. After two years, there's still a tinge of alcohol, but it's not a deterrent. As far as mouthfeel goes, this is velvety and hits your tongue with a thud of fluffiness on the initial sip. It's very pleasant indeed. In terms of a double-digit abv barrel-aged stout, there's a slight warmth in the throat and chest on each swallow, but by no means major. Considering it's such a big beer, the alcohol is well-hidden and this is a smooth ride all throughout. Damon succeeds as a big, barrel-aged stout with complex aromas and flavors. It falters with the unrelenting bourbon which takes center stage and leaves nothing else in a starring role. While the supporting cast is in the background, they are relevant enough to be noticeable and create layers of flavor. Again, a great offering, but the bourbon needs to be turned down a notch to let other flavors come through.